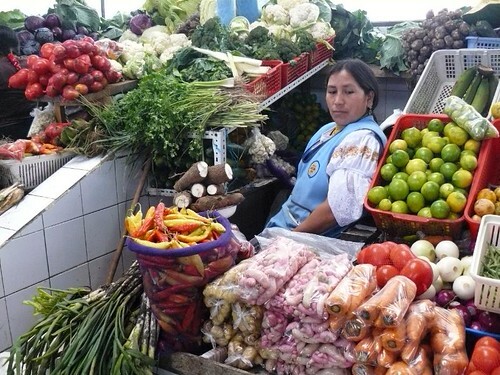 We are so blessed in Ecuador to have abundant cheap fruit and veg such as those at Cotacachi market; shopping here guarantees finding quality produce that actually has taste! … and contributes to the cheap cost of living. The market is open everyday in a purpose built building kept scrupulously clean. The photo above was taken on a Saturday but the market really comes to life on a Sunday when every booth is occupied by a trader with a bounty of quality, fresh produce. The freshness, quality always surprises, not to mention the quantity too – I sometimes wonder who buys it all! 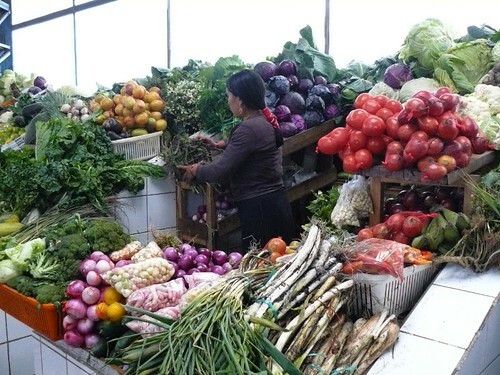 There are only 6,000 people in village but Cotacachi market seems to be set up to serve many more. 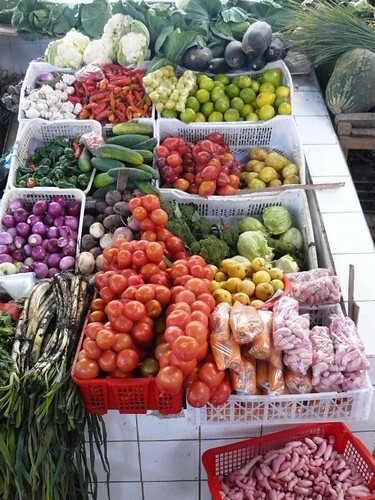 One reason fresh juice is served as a matter of course in Meson de las Flores and good hotels throughout the country is because quality fruit is so available at a cheap cost. 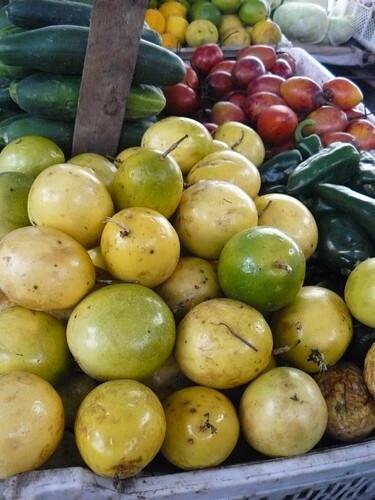 These passion fruit, the yellow fruit in the foreground of this picture cost 12 cents each. They are not at all like the scrunched up small prune-like passion fruit I remember seeing in the supermarkets of Europe. 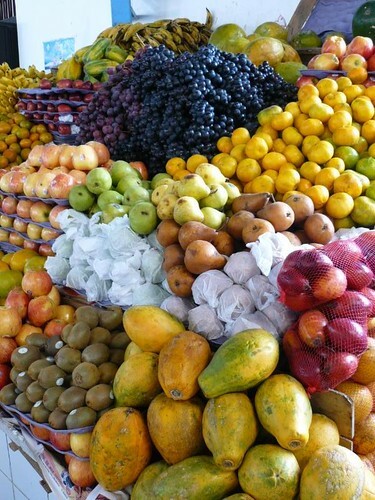 At El Meson we use them to make fresh juice and also sorbet ice-cream. The red/orange fruit in the background are tree tomatoes. They are renowned for their ability to lower cholesterol levels. The Japanese are onto this and sent a delegation to Ecuador to investigate how to rulp and powderise the fruit to produce all-natural cholesterol lowering pills for their elderly population. In Meson de las Flores we regularly serve the juice of this fruit and also serve a compote as a desert. I asked Franklin, our administrator at the hotel, to note down some of the prices we pay for fruit and veg here in Cotacachi. A large head of cauliflower or broccoli costs 50 cents. Potatoes have really gone up a lot recently and now cost 25 cents a pound. A medium sized ripe and tasty pineapple costs 80 cents. 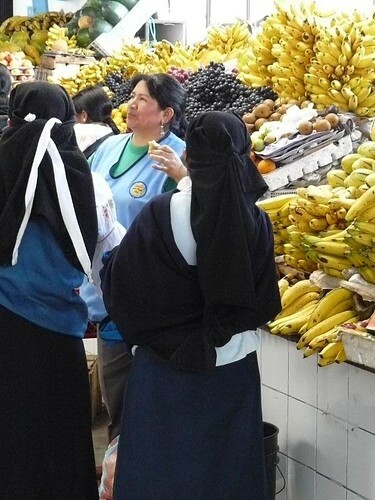 Bananas cost 1 cent each!!! A cantaloupe melon costs 80 cents – or you can by a box of them where they are priced at 31 cents each. Coconuts are 50 cents each. 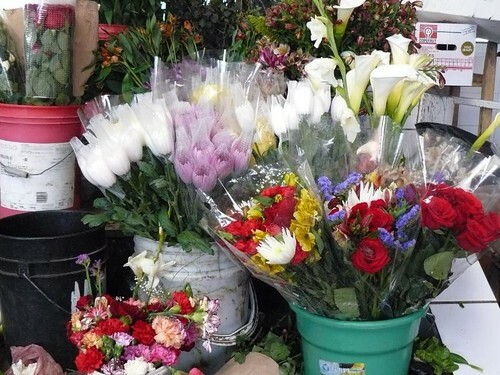 The biggest complaint that new residents have when they shop at Cotacachi market is their arms ache trying to carry it all. Even that has a solution though. Taxis run between a $1 and $1,50 and there are even local guys with cargo tricycles waiting to ride you and your fruit and veg home for 50 cents (Cotacachi itself is largely on flat land). 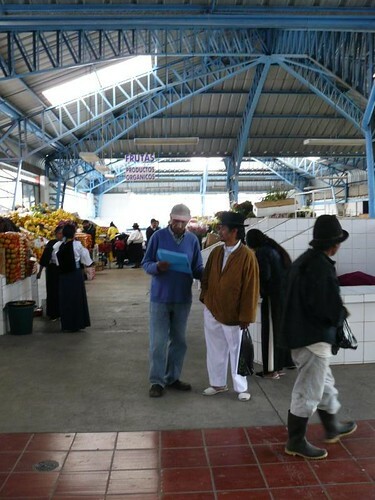 Shopping in Cotacachi market or any of the hundreds of other fresh produce markets in Ecuador means those quality living at cheap prices.